Atlantic salmon eggs are obtained from broodstock fish, bred on selected characteristics such as growth, disease resistance, maturation rate or colour. In Scotland, hatcheries use imported fertilised eggs to produce larval and juvenile fish. Once hatched, fry can be grown on in tanks either using freshwater flow-through or land-based recirculating systems (RAS), or subsequently in lake cage systems through parr stages to smolt. Smolt are transferred to on-growing systems, usually open net pen farms, to reach harvest size. The majority of smolt are produced by salmon farming companies for their own use, and usually released into seawater twice a year. The three main production systems are shown below. RAS technology can be used for either the freshwater or saltwater stage of salmon aquaculture. Flow-through hatcheries take water from nearby lochs or rivers, where it flows through grow-out tanks and raceways before being filtered and returned to its source. 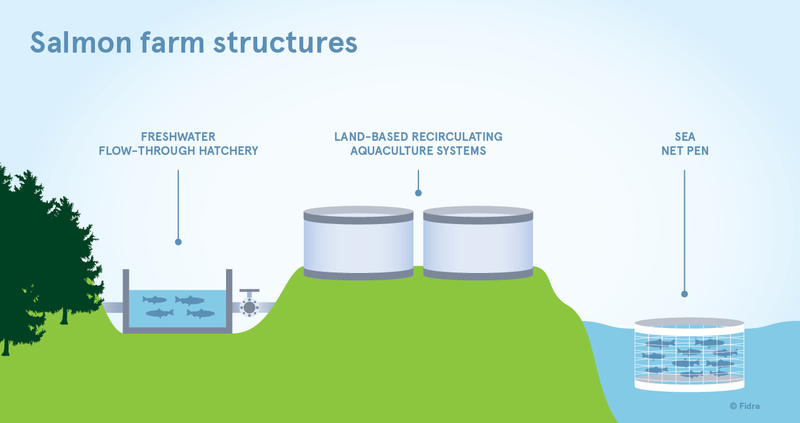 The majority of smolt production in Scotland takes place in land-based, single-pass flow-through farms.Recirculating aquaculture systems use enclosed tanks, and “recirculate” (recycle and re-use) water in a loop. The water can be either from a nearby water source such as a loch or river, or from the mains water supply. It is then connected to the sewer for waste disposal. Conversion to RAS is being undertaken and considered by many producers.When smolt are ready to go to sea, they are transported from hatcheries in specially designed boats (wellboats) or trucks (tankers) to seasites. Ongrowing at sea normally takes place in open sea net pens, cages consisting of large nets suspended from various floating walkway systems anchored to the seabed. Some production has been carried out in pump-ashore seawater tank systems. Larger sites may have cages as large as 24 m2 or 100 m in diameter, suspending nets that may reach depths of 15-18 m, enclosing water volumes of thousands of cubic metres. Several cages may be grouped together to form a seasite. Seasites are selected on their suitability with regard to water temperature, salinity, flow and exchange rates, proximity to other farms and/or wild fisheries and in compliance with local licensing regulations. Atlantic salmon grow best where water temperature is in the range of 6-16⁰C. and salinities close to oceanic levels (33-34 ‰). Water flows need to be sufficient to eliminate waste and supply well oxygenated water (approximately 8ppm). Maximum stocking densities of 20 kg/m3 are usual. On-growing in seasites takes up to 2 years, with harvesting of fish from 2 kg upwards. Seasites normally contain a single generation of fish. Harvesting takes place throughout the year, although most takes place in the last quarter of the year as this is the period of best growth. After a site is harvested, good practice is to fallow the location for a period of 6 weeks or more before introducing a new generation of fish.